« Prohibition Brewing & Tasting Room – Beer & Wings…of Duck?! Weather has been so nice it’s to resist from going outside for lunch. Of course that also screams food truck season. 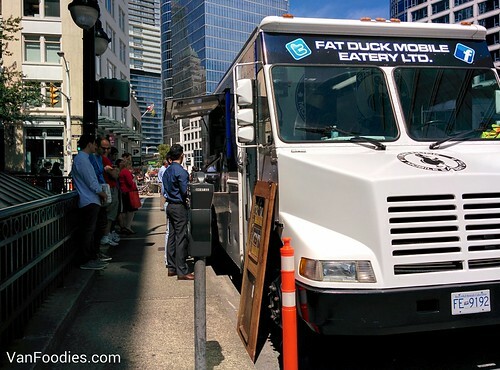 Trying to hit up food trucks that I have yet to check out, I got to the end of the line up at Fat Duck Mobile Truck. It was located at the corner of West Cordova and Howe on a Thursday afternoon. Their menu is pretty small, just 4 items — but small menu means a better focus on the food, so they would be closer to perfection. 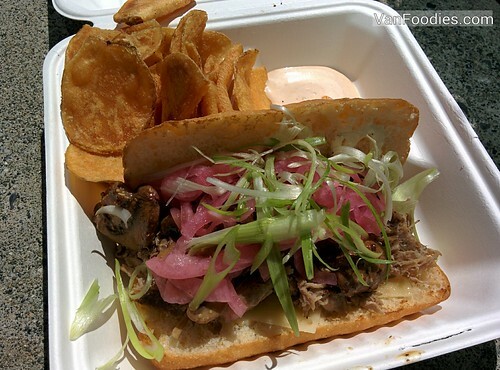 The Duck Confit “Philly” Style sandwich caught my eyes right away and I ordered it without any hesitation. And it was really good! To my surprise there were some Asian inspired flavours and flare thanks to the use of scallions and the spices used in the duck’s marinate. The duck meat almost had the flavour of Chinese BBQ duck. Lots of duck meat in the sandwich and the richness was cut down by the pickled onion and the earthiness of the sliced mushrooms and its grainy mustard marinate. The bread was nicely toasted so it had the proper crunch without making it too hard. I also quite liked the house made chips. They were thicker cuts, crispy and great to snack on with the chili mayo. It was a messy sandwich to eat…shredded duck meat, mushrooms, pickled onion all fell into the container. Grab a fork at the truck just in case! Because they only have 4 items on the menu, it’s easier for them to tackle the orders in a batch approach. That’s why the food doesn’t necessarily come out in the right order. Fear not, the wait wasn’t too crazy. I was there right at around noon and from ordering to getting the food, it only took them about 10 minutes. For $10, the Duck Confit Sandwich may seem pricey at first, but when you look at the amount of duck meat you get and the overall flavours of it, it was of decent value. I would get it again and I’m interested in going back for other menu items.